Join Signum University on March 4, 2019, at 10 am ET for a discussion about Tolkien and Medieval Romance, with Sørina Higgins and Alexander Vaughan Ames. One of the great splits in English literary history is the move from epic to romance, associated with the Norman conquest. Readers have tended to view J.R.R. Tolkien as a practitioner of epic, which he was, especially in The Lord of the Rings, but his scholarship was heavily invested in and his fiction was significantly influenced by Medieval Romance. For evidence of the former, we need look no further than his 1925 edition, with E. V. Gordon, of Sir Gawain and the Green Knight, his 1953 lecture on the poem at the University of Glasgow, and his 1975 translation of the poem along with Sir Orfeo and Pearl. 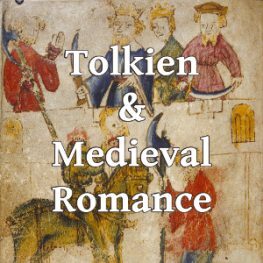 We see evidence of Tolkien’s keen and abiding interest in Medieval Romance, in particular the subgenre of the Breton Lay, in his repeated uses of and references to the tale of “Beren and Luthien,” in the quest motifs central to The Hobbit and The Lord of the Rings, and in his 1945 poem, “The Lay of Aotrou and Itroun.” Tokien’s efforts at writing romance, in authentically Medieval styles, function not only as homages to the genre but as since contributions to it, extending its life beyond the chronology of the Middle Ages. Alexander Vaughan Ames holds a B.A. in English and another in Art from the University of Missouri, a M.A. in English from the University of Alabama, and a Ph.D. in English, with a specialty in Old and Middle English Language and Literature, from Saint Louis University. He also holds a Graduate Certificate in Medieval Studies from SLU’s Center for Medieval and Renaissance Studies. His research has been focused on apocryphal contributions to Middle English manuscript and early print traditions, including Chaucer’s Canterbury Tales, applications of historical pragmatic linguistic principles to conversations in Old and Middle English literature, the influence of Medieval Welsh on Old and Middle English, and Medievalism in 19th and 20th Century British and American Literature. He has taught, online and in more traditional formats, a wide variety of courses in English and American Literature, Rhetoric and Composition, The History of Writing Technology, Technical and Business Writing, and Social Advocacy and Ethical Life at institutions ranging from Saint Louis University to the Georgia Institute of Technology to the University of South Carolina. Join us on March 4, 2019, at 10 am ET for a discussion about Tolkien and Medieval Romance!